For a local comparison to AERONET-site statistics, the monthly averages of models at the 4 grid-points closest to each AERONET-site have been interpolated (with inverse distance weights). 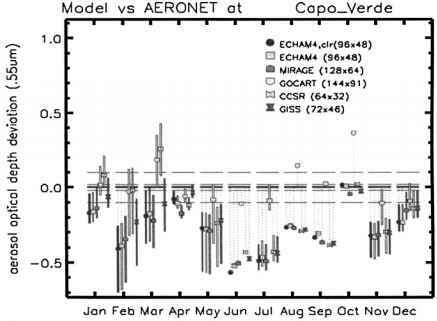 Deviations of these interpolated aerosol optical depth averages on a quarterly basis with respect to the AERONET statistics are summarized from all five models in Table 7. Table 8 extends comparisons involving particular ECHAM4 and GOCART versions. Deviations of Tables 7 and 8 are supported by more detailed model comparisons of monthly (rather than quarterly) averages, however only for the four sites of Figures 2, in Figures 5. 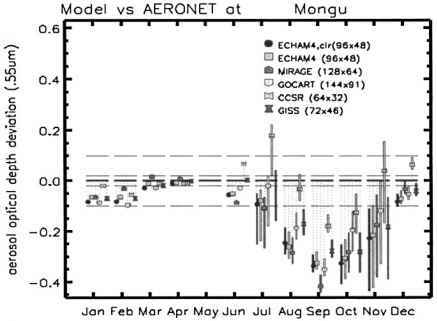 Vertical bars over symbols in Figures 5 display the uncertainty of AERONET monthly averages based on year-to-year variability (see Figures 2 and 3). The AERONET vs. model comparisons assumed (despite linear interpolation from the four closest grid-points) that local monthly averages are comparable to regional averages. The validity of this assumption was tested in comparing satellite retrieved optical depths for different spatial resolutions near each site (see Table 3). In that comparison, trends remained largely inconclusive. Thus, only deviations of mid-visible aerosol optical depths that exceeded +/-0.1 should be discussed (solid arrows in Tables 7 and 8). FIRST IMPRESSIONS : The tested models tend to underestimate aerosol optical depths with respect to the AERONET statistics. The largest model deviations are underestimates and also underestimates are much more frequent than overestimates with respect to AERONET. All models have difficulties to reproduce the large aerosol optical depths at sites near biomass burning and dust sources, in particular the ECHAM4, MIRAGE and GISS models. The CCSR model has the least underestimates at biomass burning sites, the GOCART model performs best near dust sources, and the Mirage model usually suggests the largest optical depths at urban industrial sites. Differences among the five models are large, often exceeding half of the value suggested by AERONET. Differences also change from month to month. In contrast, differences are less significant from changes in grid-spacing, based on a GOCART [2-by-2.5deg] vs. GOCART5 [5-by-5 deg] comparison. Thus, differences in-grid spacing among of the five models seem less important. Also small in comparison to the model spread are differences between ECHAM4 and its cloud-free subset, ECHAM4-clr . Larger reductions to aerosol optical depths of ECHAM4 occur mainly at urban-industrial sites and mainly during the winter when ambient relative humidity is largest. 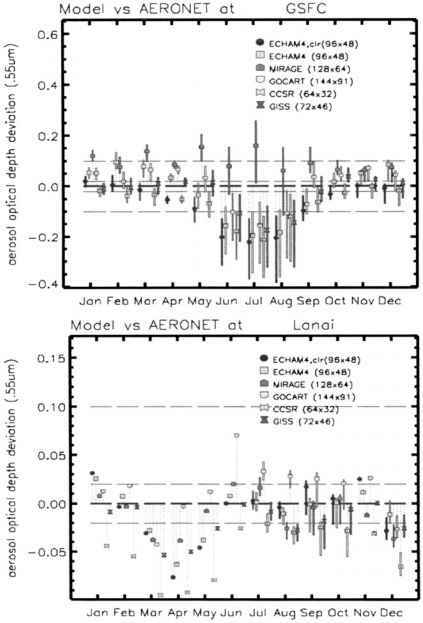 Clear-sky data sub-sets, like ECHAM4-clr, were only available for the ECHAM4 model, although such subsets seems a better match to AERONET statistics, with its conservative cloud-screening. Thus, all-sky data of models are expected to exceed AERONET averages, at least at urban-industrial sites. For most models this would increase the differences to AERONET data. Prescribed fields for sea-salt and dust in ECHAM4-old, rather than predicted fields in ECHAM4 provide on occasions a better match to AERONET data (see Table 8). This illustrates that an increased complexity will not necessarily reduce uncertainties, at least not initially, as physical processes and feedbacks need to be understood. An evaluation between ECHAM4 and ECHAM4-old reveals that better agreement for a prescribed treatment at some sites is created by compensating errors (e.g. underestimates in dustand carbon-aerosol are partially compensated by sea-salt overestimates). 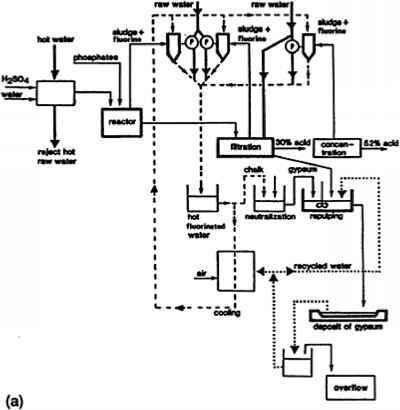 This illustrates, that an evaluation of the model performance has to be conducted on an aerosol sub-component basis.